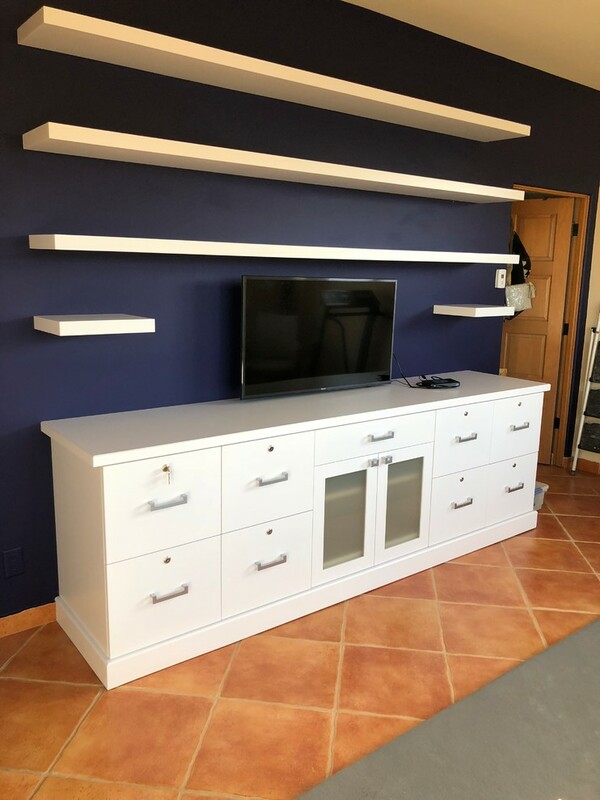 My beautiful contemporary, suspended shelves and coordinating cabinetry, including 4 filing cabinets, is beyond my expectations. The work includes drawers to house my printer, out of sight. The work is immaculate. The soft closing of the drawers and cabinet is luxe. The finishes are perfect. The installation was professional and attentive to every detail. Paul was clean, precise and helpful in making sure all of the grommets needed for electrical cords were complete. He worked with my designer to help me redesign my entire office. He even put up with my overly friendly Aussie who thinks if you are on the floor you want to play! Mine was a smaller job, for him and Joe, but he treated it as if it were a big project. He takes great pride in his work. I am new to having custom builds, but I am not sure I can ever go back! Thanks, Paul and Joe! I love my office space!